All Games > Action Games > pixelBOT EXTREME! EXTREME! multitasking RUN and GUN with a colorful twist! 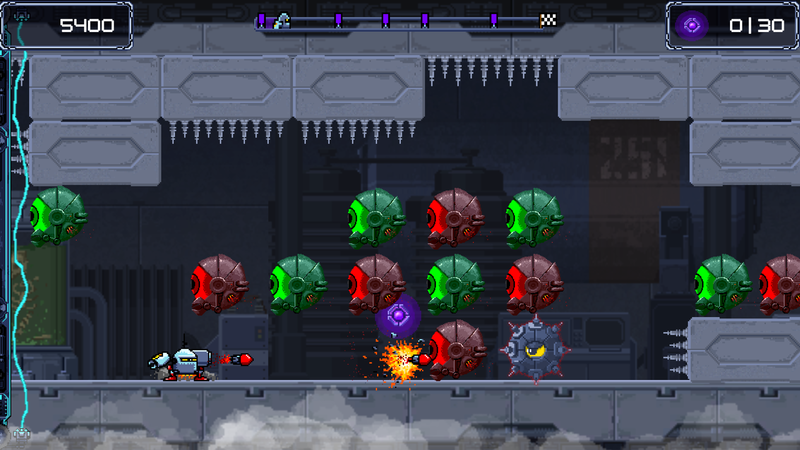 Team up with pixelBOT, shoot up everything in your way and master a unique color-based destruction! Show what you've got and help the BOT breaking out of the Forbidden Factory! EXTREME! update v1.1.0: TRICK or TREAT! More ACTION! More CONTROL! More AWESOMENESS! With the Halloween 2018 update we adjusted world 1 completely and moved our colorful gameplay twist right to the start of the game! Reworked world 1: Shoot right from the start! Early gameplay twist: Collect your first two rockets in levels 1-1 and 1-2! React and shoot faster: Increased shooting rate! NEW: Auto-shooting option in the settings! NEW: Play with one hand: If auto-shooting, use LB or ALT to switch between your rockets! NEW: Two gravity options: Flappy (High gravity) and Weightless (low gravity)! NEW: Level loading screen incl. useful tips and tricks! NEW: Keyboard players without a NUMPAD: Use arrow keys to shoot! Reworked some EXTREME! levels to achieve the ultimate challenge! Fixed the "cam starting bug" - no more dying at the very first start! Improved camera scrolling on the world map! Lower orb requirements at world map barriers! Less is known about pixelBOT’s fate – just one thing is clear: He needs to get out of here! Now it's YOUR turn: Team up with pixelBOT, shoot up everything in your way and help him breaking out of the Forbidden Factory! MULTI-STAGE BOSS FIGHTS! - Show what you've got and survive the ultimate color-based battles! © 2018 play.HEART games. All Rights Reserved.